LG has an ongoing smartphone problem: despite a few valiant efforts (the G2x comes to mind) the company continues to live in the shadow of rival Samsung. Most of this malaise can be attributed to hit-and-miss hardware combined with lackluster software (we're looking at you, Spectrum). Last February, at Mobile World Congress, LG spiced things up with an attractive collection of devices including the Optimus L7, Optimus Vu and Optimus 4X HD -- the latter being one of the first quad-core handsets announced. Now, six months later, we live in a world where the global versions of HTC's One X and Samsung's Galaxy S III dominate the superphone market and share the quad-core crown. With me-too features like a Tegra 3 processor, 4.7-inch HD display, 8-megapixel camera and Ice Cream Sandwich on board, the Optimus 4X HD appears ready to play in the big leagues. Does it succeed or is it just a flash in the pan? Is it all style over substance or does it bring something unique and meaningful to the table? Hit the break for our full review. LG's Optimus 4X HD may not have toppled Samsung's Galaxy S III and HTC's One X from the quad-core throne, but it's definitely made it to the royal court. How would you rate the Optimus 4X HD? If Samsung's Galaxy S III occupies the curved, organic, pebble-like end of the design spectrum, LG's Optimus 4X HD is the polar opposite -- angular, manufactured, slab-like. With this handset, it's easy to assume that LG's skating where the puck used to be (the squarish Galaxy S II) until you notice the family resemblance -- the Optimus L7 and Optimus Vu share the same aesthetic. As with the One X, there's something instantly likeable about the 4X HD's proportions. Where the Galaxy S III's graceful lines take a while to grow on you (the white one being our favorite), LG's quad-core Optimus grabs your attention from the onset. Our white review unit (it's also available in black) is particularly striking -- this is a safe, but elegant design, the kind of phone you'd expect James Bond to accessorize his tuxedo with. Build quality is solid, with no flexing or creaks but the One X's machined, polycarbonate unibody still trumps the Korean competition -- like the Galaxy S III, the 4X HD's plastics look and feel a little cheap for a flagship. It's the kind of phone you'd expect James Bond to accessorize his tuxedo with. In front, the Optimus 4X HD is all Gorilla glass. A white bezel surrounds the 4.7-inch display, interrupted only by three backlit, capacitive buttons at the bottom and the proximity sensor, earpiece, LG brand and 1.2-megapixel front-facing shooter up top. 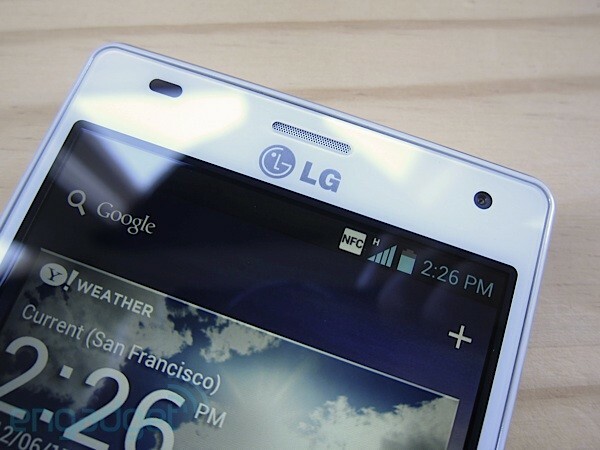 That silver LG logo looks like an afterthought right below the earpiece's tastefully recessed white mesh grille. It's worth noting that those capacitive keys are invisible until backlit and difficult to see in bright sunlight so you'll have to memorize the order: back, home and menu (from left to right). Yes, like Samsung with the Galaxy S III, LG's clinging on to some vestigial menu button instead of rightfully providing a recent apps key. While a long press of the home button brings up the recent apps list, the 4X HD's key layout is the exact reverse of the Galaxy S III's. Why is it that, two Android versions beyond Gingerbread, manufacturers still can't agree on button placement? Here's a hint Samsung and LG: Ice Cream Sandwich and Jelly Bean already provide a standard key layout -- use it. Flip the Optimus 4X HD over and you're greeted by a vast, white, textured and removable plastic back cover adorned with an 8-megapixel autofocus camera mounted in a flush, machined aluminum pod and flanked by a single LED flash (top left), another LG logo (embossed and centered below) and two horizontal slits covering the mono speaker (bottom left). Like with the earpiece on the front, the attention to detail and the fit and finish are impressive. The battery door's edges are beveled and contribute to about half of the handset's 8.9mm (0.35-inch) thickness, making the 4X HD extremely comfortable to hold despite its chiseled build. Speaking of thickness, it's not the only measurement that's on par with the competition -- at 141g (4.97 ounces) and 132 x 68mm (5.2 x 2.68 inches), weight and footprint are also similar. Pop the back cover off and you'll find an NFC antenna embedded in the back of the door, with matching contacts on the phone next to the standard SIM holder and microSD card slot above the removable 2,150mAh Li-Ion battery. The battery door's edges are beveled and contribute to half of the handset's thickness. What's left of the sides of the Optimus 4X HD -- the flat half that's not a part of the beveled back cover -- is delimited by two chromed-plastic rims, one following the edge of the front glass, the other meeting the seam of the battery door. This white plastic area is host to various connectors and buttons: a standard 3.5mm headphone jack, secondary mic and power/lock key on top; a micro-USB / MHL port, primary mic at the bottom; a volume rocker on the left; and nothing on the right. Here again, LG shows impeccable craftsmanship, with a subtle, recessed, pyramid-like pattern adorning the white plastic left and right sides, and the volume rocker protruding just enough to be located by feel. 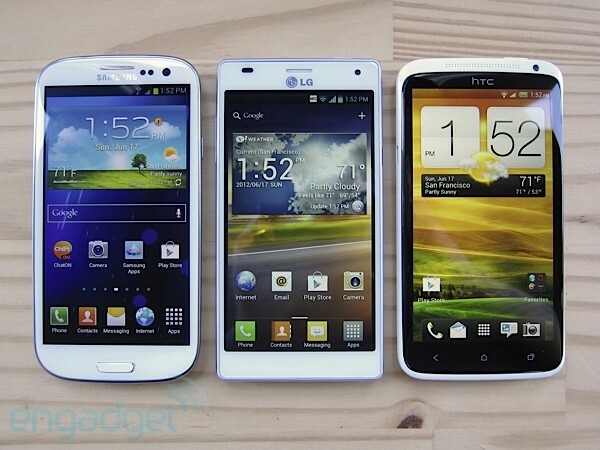 Sadly, the Optimus 4X HD's "True HD IPS" capacitive touchscreen falls short of the One X's phenomenal Super LCD 2 and the Galaxy S III's brilliant Super AMOLED displays. It's certainly a fine 4.7-inch, 1,280x720-pixel panel in its own right -- non-PenTile and bright, with deep blacks, natural colors and respectable viewing angles. The problem is glare, especially in direct sunlight and when looking at the screen from vertical angles greater than 30 degrees. We suspect that this is the result of the display not being bonded to the front glass -- a glaring omission (pun intended). This deficiency can somewhat be overcome by boosting the screen brightness, but at the expense of battery life, of course. The problem with the display is glare, especially in direct sunlight. Spec-wise, the Optimus 4X HD ticks pretty much every superphone checkbox other than LTE -- but hey, that's what LG's Optimus LTE II is for, right? Under the hood lurks NVIDIA's now-familiar 1.5GHz quad-core (4-PLUS-1) Tegra 3 SoC powerhouse, 1GB of RAM, 16GB of built-in storage, quadband HSPA+ 21Mbps (850 / 900 / 1900 / 2100MHz) plus quadband EDGE (850 / 900 / 1800 / 1900MHz) unlocked radios, WiFi b/g/n, Bluetooth 4.0 LE, GPS / AGPS and NFC. Practically speaking, this means you'll be able to enjoy the 4X HD almost anywhere in the world except on AWS 3G networks like T-Mobile in the US and Wind in Canada (we used an AT&T SIM without any issues). While the microSD card slot can be mounted as a USB mass storage device, the only way to access the 16GB of internal flash is via MTP or PTP. The usual array of sensors tops off the features list, including ambient light, proximity, compass, accelerometer and gyroscope. Unfortunately, there's no notification LED. The 4X HD feels snappy across the board. From the moment we put our mitts on the Optimus 4X HD, it was clear that this handset is no slouch. That's to be expected, considering the athletic Tegra 3 chip hiding within. Still, LG has a history of riddling its top-notch hardware with sub-par software. Thankfully, the company's mild Ice Cream Sandwich customizations have kept the stock performance (and experience) mostly intact. The 4X HD feels snappy across the board, as confirmed by our suite of benchmarks. Other than AnTuTu, Most results match what we recorded on the global version of HTC's One X. Radio performance matched our expectations, with no issues to report. Calls sounded loud and clear in our tests, and noise cancellation worked particularly well. The built-in speaker is somewhat tinny sounding, but gets the job done. We saw download speeds of up to 6.2Mbps and upload speeds around 1.3Mbps on AT&T's 3G network in and around San Francisco and Los Angeles -- in line with other unlocked HSPA+ devices we've used on the US' largest GSM carrier. Battery life, however, is less stellar. In our standard rundown test, where we start with a full charge and play a video in a loop with the display brightness and volume set to half, a 75 percent or better 3G signal, WiFi and GPS enabled but disconnected, and Bluetooth disabled, the Optimus 4X HD's 2,150mAh battery lasted six hours and 21 minutes. That's on the lower end of the spectrum when compared to the current crop of high-end Android phones. Also, while this result is similar to what we observed with the Tegra 3-equipped One X, HTC's flagship only packs a 1,800mAh cell. We managed to get about 14 hours of moderate use from the 4X HD -- that's checking email and social networks, occasional calling and texting, taking a few pictures and light web surfing. This means most folks will be able to use LG's quad-core Optimus for an entire day on a full charge but power users will likely want to bring a charger. Getting the camera to focus on anything but the middle of the frame is an exercise in frustration. The Optimus 4X HD camera is a mixed bag. While there's nothing wrong with the hardware -- a modern 8-megapixel backside-illuminated sensor and autofocus lens paired with a single LED flash and capable of recording HD video at 1080p -- the software is flawed. There's really no problem with the user interface, which is comprehensive and intuitive. Our gripe comes from an autofocus strategy which provides zero flexibility. The shooter is continually re-focusing but there's absolutely no way to prevent this. There's no dedicated two-stage camera key, no way of touching and holding the on-screen shutter button to lock focus and exposure then releasing it to take the shot. Even touch-to-focus is broken, focusing only briefly where you point but then returning to that continuous focus leitmotif before you even have a chance to snap the picture. Needless to say, getting the camera to focus on anything but the middle of the frame is an exercise in patience and frustration. Let's hope LG fixes this soon. It's too bad, really, because the resulting shots are quite lovely. Colors are perhaps a little soft but white balance and exposure are pretty accurate. Low light performance is decent enough -- noise only rears its ugly head in the most extreme of circumstances. The Optimus 4X HD features HDR, panorama and burst modes, the latter capturing about four to five frames per second but limited to VGA resolution. When it comes to moving pictures, the 4X HD records 1080p HD video at 30fps with continuous autofocus and mono audio. Image and sound quality are certainly fine for content encoded at 10Mbps -- there's some excess sharpening and more autofocus hunting than we're comfortable with, but nothing that can't be remedied with a software update. As it currently stands, LG's quad-core Optimus falls short of the Galaxy S III and One X in the camera department, but there's still some untapped potential. This UI is ahead of anything we've ever sampled from LG. 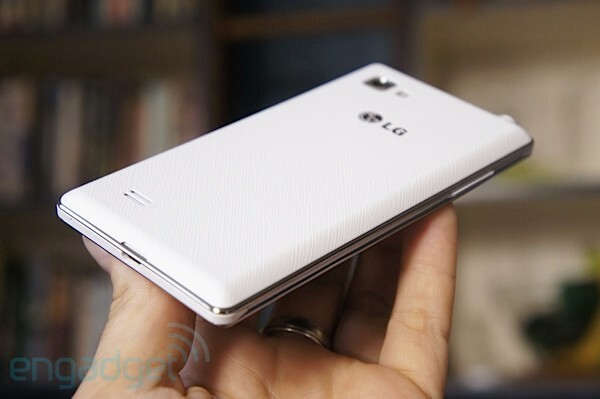 We were pleasantly surprised with LG's UI 3.0 skin running on top of Ice Cream Sandwich when we reviewed the Optimus L7 recently and we're happy to report that the Optimus 4X HD follows suit. Billing itself as "unobtrusive and simple", this latest UI is leaps and bounds ahead of anything we've ever sampled from LG before -- both in terms of experience and performance. What you're getting then is mostly stock Android 4.0.3 with a few embellishments -- some actually useful, others purely cosmetic. The quick settings menu in the notifications tray is definitely a worthy feature. By default it lets you access the QuickMemo app (used to annotate what's on the screen and save the result as a picture, Galaxy Note style), switch sound profiles, enable / disable WiFi and turn Bluetooth on / off. Of course it's fully configurable with several other settings to choose from, such as airplane mode, GPS, NFC and hotspot. Also useful are the four customizable quick-access apps on the lock screen. The launcher adds several tweaks, including some reminiscent of CyanogenMod (the 5x6 app grid option) and our favorite -- the ability to create folders in the app tray by simply dragging and dropping apps. Oh, and five apps can be packed in the dock, up from the default four. On the more cosmetic end of things, you're able to select different transition effects for the home screen and one of five clock widgets for the lock screen. There's a download tab in the launcher, in case you lose track of what you've installed. When it comes to pre-installed apps, LG's kept clutter to a minimum. Keep in mind that our review unit is being sold unsubsidized -- carrier versions will likely feature additional bundled apps. LG's apps include Application Manager (to add / remove some of the shipping apps and widgets), Cell Broadcast (to send / receive cell broadcast alerts), LG Tag+ (to program the supplied NFC tags), Memo (for note taking), RemoteCall Service (lets an LG customer support rep control your handset for diagnostics), SmartShare (for DLNA functionality), and SmartWorld (LG's app store). Yahoo! 's Finance, News and Weather apps also come pre-loaded, along with Polaris Office. Only some of these apps can be uninstalled, but all of them can be disabled. 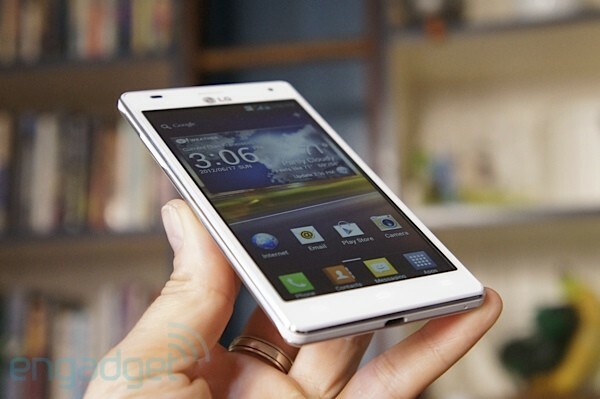 You'll find even more info about UI 3.0 in our Optimus L7 review. It's clear that with the Optimus 4X HD LG's trying to step things up a notch and break away from an embarrassing string of forgettable smartphones. From a design standpoint it's a hit -- the 4X HD is refined and well-crafted, with great attention to detail. At this price point (€490 / $590) we'd prefer fancier materials, but this also applies to Samsung's Galaxy S III. Spec-wise it fits the bill, at least on paper. The display, while better than most, misses the mark when compared to the screen on HTC's One X, mostly due to excess glare. Battery life is a little underwhelming as well, despite the generous 2,150mAh cell. Finally, we'd like to see a software update to unleash the camera's full potential, especially when it comes to the autofocus. Regardless of these limitations, the Optimus 4X HD packs a serious punch in terms of performance -- it runs one of the fastest and least offensive Ice Cream Sandwich skins we've encountered to date. Ultimately, LG's flagship may not have toppled Samsung's Galaxy S III and HTC's One X from the quad-core throne, but it's definitely made it to the royal court.